Eye care specialists use several tests to diagnose eye cataracts. An eye cataract is a clouding of the eye's natural lens. The lens of your eye lies behind the iris and the pupil. Over time, a cataract may grow larger and cloud a bigger portion of the lens, making it harder for you to see. Eye cataracts can be diagnosed by an optometrist or an ophthalmologist by performing a series of tests, usually included in a comprehensive eye examination. The following tests help doctors diagnose eye cataracts and determine their severity. A visual acuity test measures your quality of vision at certain distances. Your doctor will ask you to read letters of various sizes from a chart. Your eyes will be tested individually and together to measure the accuracy of your eyesight at different distances. A visual acuity test is an easy, painless, and quick way to diagnosis cataracts, although more tests will be needed to make sure cataracts are the cause of your vision problems. A potential acuity test or PAM test is a different way to measure how good the eye will see if the cataract did not exist. Surgeons need to know that the cataract surgery will improve the patient's vision. A PAM test projects a visual acuity eye chart with letters into the eye with a laser and by-passes the cataract. The patient simply reads the chart similar to a normal eye chart on the wall. If the best measurement they receive is 20/40 and not 20/20, they know that if cataract surgery is performed on a certain eye, that they will have at least 20/40 vision after the surgery. This test becomes more important when another eye disease exists in addition to the cataract. Contrast sensitivity testing is similar to visual acuity testing but places greater emphasis on how cataracts can decrease image contrast due to light scattering and glare caused by the cataract. Eye doctors consider contrast sensitivity testing to be a more realistic measurement of true quality of vision. A slit lamp is a special type of microscope that magnifies your eye so your doctor can examine the lens to determine the presence and severity of a cataract. Your doctor will ask you to place your chin on the chin rest of the slit lamp. A light will then be directed at your eye. By looking through the slit lamp, your doctor can examine the lens to determine the degree to which it is clouded. Pupil dilation is a common test used in diagnosing cataracts. Clouding of the lens is not noticeable until a cataract reaches an advanced stage. When your eye is dilated, however, the pupil increases in size, offering a view of your entire lens. By thoroughly examining the lens, a doctor can determine whether or not a cataract is affecting your quality of vision. 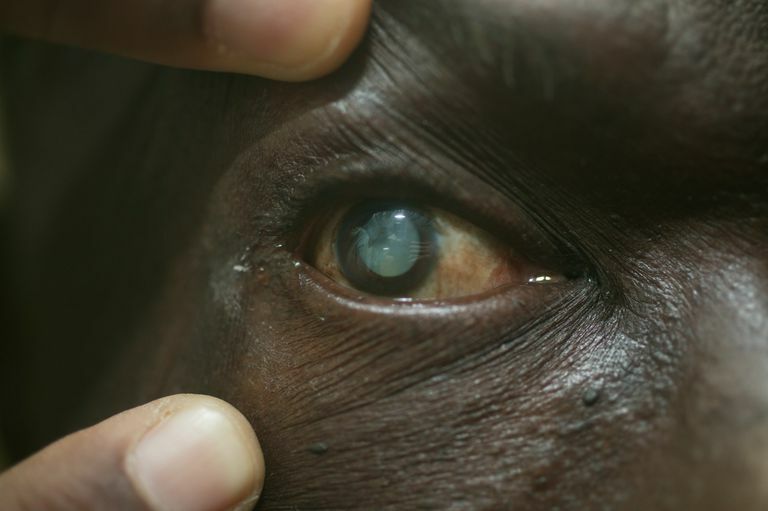 Although most people associate cataracts with aging, cataracts can also develop after an eye injury, as a result of another eye disease, after using certain medicines, or as a result of health problems such as diabetes. Because some children are born with congenital cataracts, testing your child for cataracts may be necessary if you think your child is having a vision problem. Further testing can help determine which type of cataract is present and if cataract surgery, or another treatment, should be prescribed. American Optometric Association. "Clinical Practice Guideline: Care of the Adult Patient With Cataract." American Optometric Association, 1995.